Methylsulfonylmethane, or MSM, is a sulfur-rich, natural chemical found within plants, humans and animals. MSM can also be processed in a lab, serving as an ingredient for various health supplements. Methylsulfonylmethane is present in foods such as leafy greens, whole grains and fruits. The hallmark of MSM is its sulfur content. When we eat a balanced, healthy diet that is rich in raw foods, we may be getting all the sulfur we need. However, when foods are heavily processed, sulfur is lost along the way. Sulfur is a necessary nutrient that benefits the body in many ways. It is involved in important enzyme reactions and assists in the production of collagen, the element that gives structure to arteries, hair, skin and nails (x). Methylsulfonylmethane acts as a “sulfur donor” when the body needs it (x). 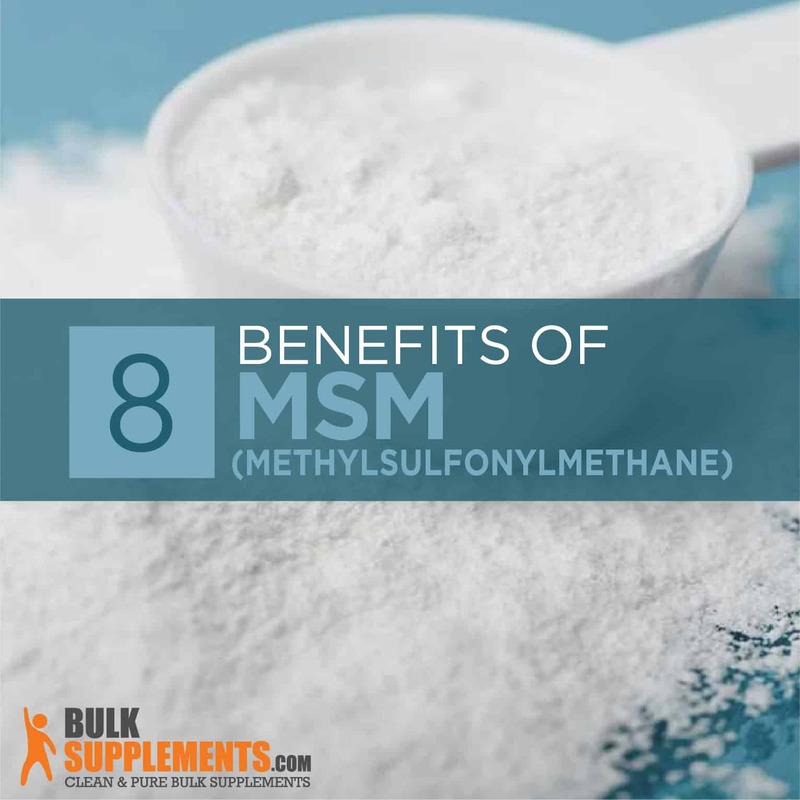 For its sulfur content, its support of body systems and its ability to alleviate symptoms of illness, MSM is enjoyed in concentrated form as a health supplement. It’s valued as a natural way to treat a growing number of health conditions, including pain, allergy relief and digestive support. MSM is also being employed to boost the immune system, optimize good skin and alleviate symptoms of PMS. It may even be a suitable alternative medicine to tackle conditions such as osteoporosis, cancer and HIV. Methylsulfonylmethane has gained popularity for being anti-inflammatory, and this benefits a long list of health problems. MSM also reduces oxidative stress, which is a side effect of many medical conditions. MSM’s effectiveness as a natural anti-inflammatory element is tremendously versatile, helping the digestive tract, the joints and other areas of the body (x). MSM cooperates effectively with other natural supplements such as glucosamine and chondroitin (x). They each bring their own unique qualities to the table and work effectively to eliminate problems such as joint pain. A variety of issues can cause joint pain. Joints are what makes your body parts move, and most of the time, we don’t think about them. When they are hindered for various reasons, however, we take notice. Joint pain interferes with movement and is caused by a variety of issues, including sprains, arthritis, gout and other injuries and health conditions (x). Acute joint pain can last for a few weeks, and chronic joint pain lasts longer. Even temporary, short-term joint pain can interfere with a person’s normal routine, and most patients seek a way to immediately manage it. Though medication is available, many people are looking for ways to relieve pain without pharmaceutical side effects. Since various forms of inflammation can cause joint pain, reducing the inflammation can also minimize the pain. That’s where methylsulfonylmethane comes in; MSM has qualities that reduce inflammation. MSM can also reduce the breakdown of cartilage, the material that protects the ends of bones next to joints (x). One research study targeted people over the age of 50 who were given 1,200 mg of MSM for 12 weeks. The results showed a decrease in swelling, stiffness and pain in the joints (x). They also experienced improved ability to walk and get out of bed (x). The MSM supplement they were given included glucosamine, which partners well with MSM. Glucosamine supports connective tissue strength and MSM optimizes connective tissues performance (x). Arthritis is a chronic case of joint pain and inflammation, and MSM has helped those who suffer with this long-term condition. Researchers studied 49 people with knee osteoarthritis, and when they took a 3.4 gram dose of MSM for 12 days, pain and stiffness decreased and overall function improved (x). The immune system contains a network community of cells, tissue and specialized organs. It works together to protect the body from disease and stress. The immune system can be hampered by poor diet, stress, poor sleep or lack of exercise. For several reasons, MSM can benefit the hardworking immune system (x). Methylsulfonylmethane contains sulfur — the third most available mineral in our bodies. We get sulfur from protein, but not all amino acids in proteins contain sulfur, and not all sulfur supplements contain the kind of sulfur best absorbed by the body. MSM, though, provides the kind of sulfur the body can use — natural and organic (x). MSM tackles and suppresses inflammatory elements that would otherwise target and weaken the immune system (x). Methylsulfonylmethane has a role in producing glutathione, a major antioxidant. MSM also assists in keeping glutathione at healthy levels (x). Keratin is the protein that forms hair, skin and nails. Keratin is created with a sulfur-rich amino acid called cysteine. Without enough sulfur in the body, the amount and strength of keratin would be compromised. MSM “donates” its sulfur to keratin, keeping hair, nails and skin healthy and strong (x). It also inhibits wrinkles, premature aging, unpleasant redness, and skin irritation (x). MSM can also help hair stay healthy and counteract hair loss. Keratin and collagen are non-negotiable essentials when it comes to forming new strands of hair. MSM plays a role in supporting levels of these elements in the body, and research shows that the sulfur in MSM forms important bonds that support hair growth (x). Leaky gut syndrome plagues many people. With this condition, undigested food, toxins and bacteria can permeate the intestines and leak into the bloodstream. MSM’s sulfur contribution can help heal the lining of the digestive tract and inhibit the inflammation that contributes to this condition (x). Premenstrual syndrome (PMS) can occur when there’s an extra “toxic load” on the body. Toxins severely interfere with hormones, and disrupted hormones are the general cause of PMS. The bad news is that PMS can get worse with age. Luckily, MSM can rescue toxified hormones by boosting and improving one of the body’s detoxification processes — methylation (x). Intense exercise can result in muscle pain and soreness, but methylsulfonylmethane can help by reducing inflammation and oxidative stress. In one study involving 18 men, subjects consumed MSM powder for ten days. The results confirmed that MSM greatly reduced muscle damage and increased antioxidant functions following exercise — in this case, a 14 km run (x). Another study involved a divided group of 22 women who received MSM or a placebo for a training period three weeks before they ran a half marathon. The MSM group confirmed less joint pain and muscle soreness than the group getting the placebo (x). Allergies are common, chronic and definitely annoying. When the body senses a harmful substance and overreacts to its “invasion,” an allergy can be the result. The immune system makes an antibody called immunoglobulin that is tasked with responding to those “invaders.” The overreaction to certain substances come in the form of symptoms such as watery eyes, runny nose and sneezing. One study tested people who suffered from seasonal allergic rhinitis, giving them supplements of MSM. The individuals tested had reduced allergic symptoms (x). It’s believed that methylsulfonylmethane relieves allergy symptoms because of its anti-inflammatory properties that prevent the allergen from connecting with the antibody (x). Cancer: Several studies have recently shown MSM does stunt the growth of certain cancer cells (x). MSM also appears to damage cancer cell DNA, stimulate cancer cell death and prevent the spread of cancer cells. Lab research has also shown use of MSM can reduce tumor size (x). Though research is relatively limited, the use of MSM in cancer treatment looks promising (x, x). HIV: Recent research showed that MSM reduced inflammation and restored glutathione levels in lab animals weakened by HIV proteins (x). Optimal dosages have not been set for use of methylsulfonylmethane. Variety in supplement ingredients makes it difficult to set standards; follow the packaging directions when taking MSM. Methylsulfonylmethane, stored in the adrenal cortex and the spinal fluid, supplies the body with the sulfur it needs. The body needs sulfur for a variety of processes. Sulfur is important in the creation of methionine, which forms connective tissue among other tasks. In days of old, people ate a different diet — one that was rich in various animal parts and raw fruits and vegetables. Today, people can be lacking in these foods, which brings sulfur to lower levels. As we age, sulfur levels decrease, compromising our bodies even more (x). After years of eating overprocessed foods, absorbing toxins and dealing with stress, our bodies may take on diseases such as arthritis, leaky gut syndrome and a number of chronic conditions. Luckily, MSM is a sulfur-containing compound that can naturally treat these issues.